Large, multispan cable-stayed bridges are relatively rare structures, yet two are now being built in the U.K. alone. 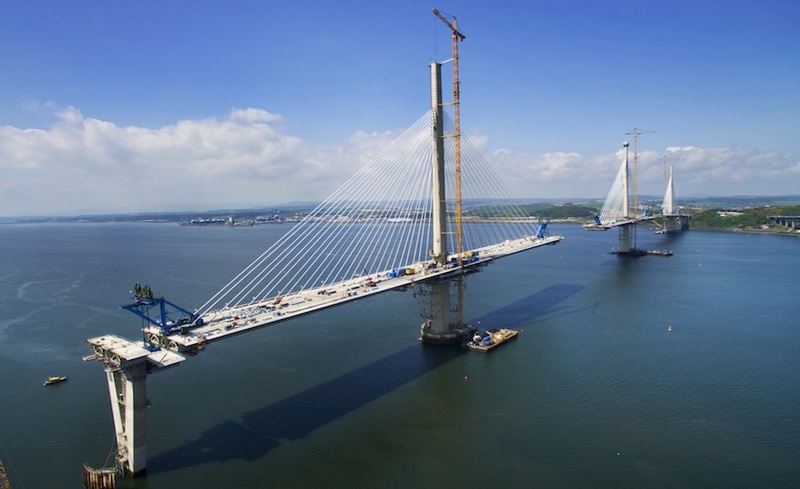 Nearly all the cables on the emerging bridge across Scotland’s Firth of Forth waterway are in place, while the first stays are beginning to rise over the River Mersey crossing, 320 kilometers to the south. 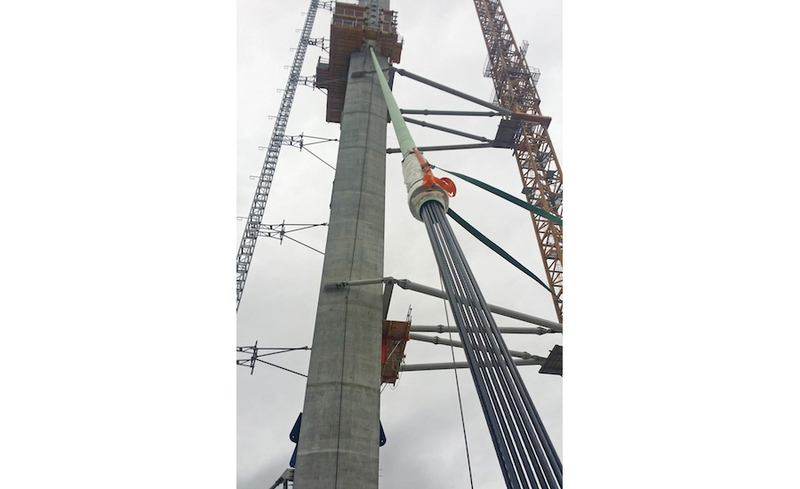 Both cable-supported bridges include three towers and are due for completion by international teams of contractors next year. But the bridges differ in financing, structural form and construction methods. 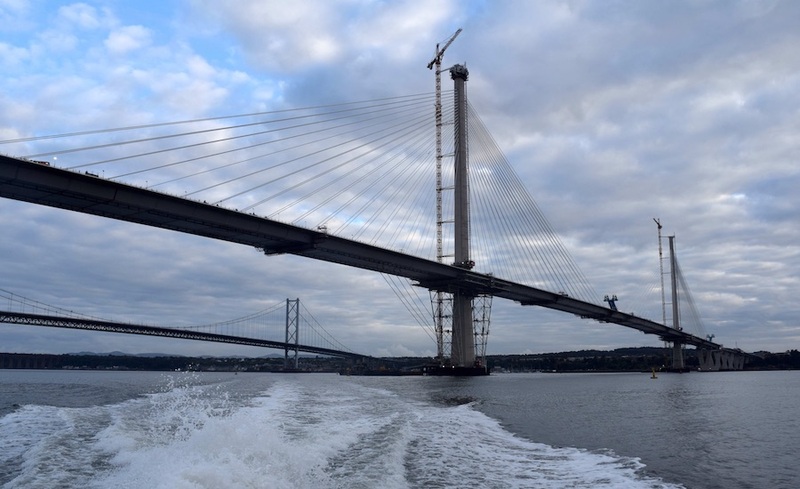 Funded directly by the Scottish government, the “Queensferry” crossing, near Edinburgh, is being built to take traffic off the nearby Forth Road suspension bridge, which has suffered corrosion since its 1964 opening. Procured under a design-build contract, the new bridge’s deck is formed by prefabricated steel-tub girders with compositely cast concrete tops. Taking a different approach, the owner of the “Mersey Gateway” bridge, running between Widnes and Runcorn, adopted a design, build, finance and operate (DBFO) contract for its cast-in-place prestressed-concrete crossing. The bridge will augment the heavily trafficked 55-year-old Silver Jubilee steelwork arch bridge. 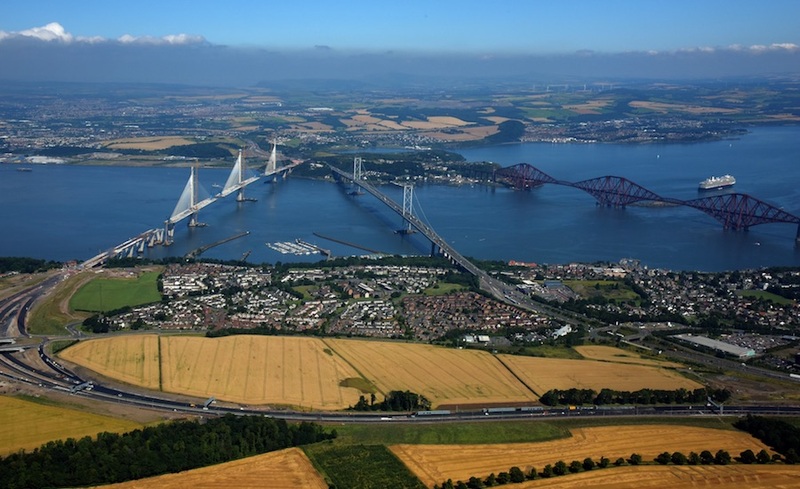 In Scotland, work began on the Queensferry crossing in 2011, with a May 2017 completion deadline, says a spokesman for the owner, Transport Scotland. Bad weather scuppered plans for an early completion this December, he adds. The roughly 2.7-km-long crossing includes a cable-stayed stretch, with two 650-m-long main spans and 223-m back spans. Its deck is about 40 m wide, including walkways, and about 5 m deep. Fanning down from the towers, 288 cables, some up to 420 m long, support the crossing. The Queensferry's cables are in two planes along the deck’s centerline. Some cables from opposite towers overlap on either side of the central spans to increase their stiffness. The north and south towers are 203 m tall, and the center tower is 210 m.
Forth Crossing Bridge Constructors has the project’s fixed-price design-build contract, which is worth nearly $1 billion at current exchange rates. The consortium is controlled equally by Germany’s Hochtief Construction A.G., U.S.-based American Bridge International and Spain’s Dragados S.A. Locally based Morrison Construction Ltd. has a minority share. FCBC procured 35,000 tonnes of steelwork from China, delivered in five shipments, according to American Bridge. Other elements came from Poland, Spain and the U.K. The first prefabricated deck module went up in October 2014. It was one of 12 placed by a floating crane on temporary falsework fixed to the towers. Starting in September 2015, the remaining 110 elements are being placed by gantries on the previously erected deck and suspended by stay cables. Early this year, the contractor linked the deck with the northern approach. Next, the team closed gaps on deck sections between the center tower and the south tower in October and between the center tower and the north tower in November. “The focus now is on achieving … final closure between the south tower and the southern approach viaduct, which is planned for early in the new year,” notes the contractor’s project director, Michael Martin. With much more modest spending power than Scotland has, the Halton Borough Council, a small local authority, got contractors to finance its Mersey bridge. In 2014, the council signed a 30-year design-build-finance-operate contract with Merseylink Consortium. The contract’s whole-life value, including extensive highway work, is roughly $870 million at today’s prices. Spain’s FCC Construcción S.A. and two investment companies make up Merseylink, which is financing the deal in exchange for toll revenues. A separate joint venture of FCC, Kier Infrastructure and Overseas Ltd., and Samsung C&T Corp. forms Merseylink’s design-build contractor. 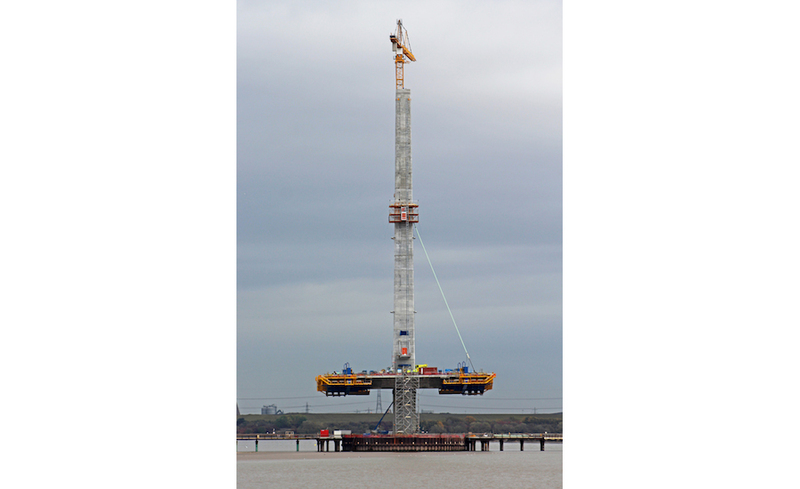 The Mersey Gateway bridge will cross the river, east of Liverpool, in four spans, totaling 998 m. It will be supported by 146 cables from three towers, ranging in height from 80 m to 125 m.
Concrete teams now are casting the 4.5-m-deep trapezoidal box-girder deck on sets of traveling formwork. Crews are working out from either side of the towers in generally 6 m lengths. The first cable went up on the south tower late last month, marking “a new, very visual phase,” according to Gareth Stuart, Merseylink’s project director.